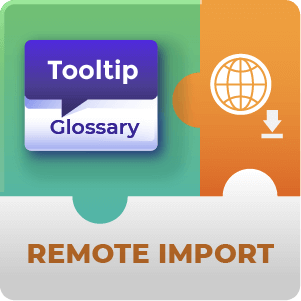 Allows you to display informative tooltips while editing pages or posts in the back-end in both visual and textual mode. 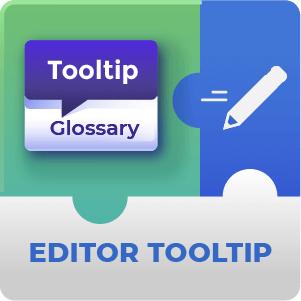 The Glossary Editor Tooltip allows you to display informative tooltips while editing pages or posts in the Back-End. It enables the tooltips in the title, content and excerpt of the post or page. It will show in both editor modes (visual and text). 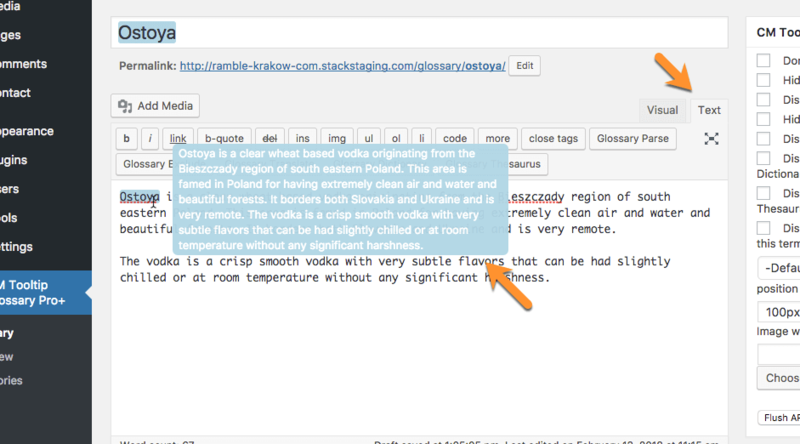 Editor Tooltip enables tooltips in the Back-End. It even recognizes formatted content, such as bold, links, and headers. The highlights appear in both visual and text modes. 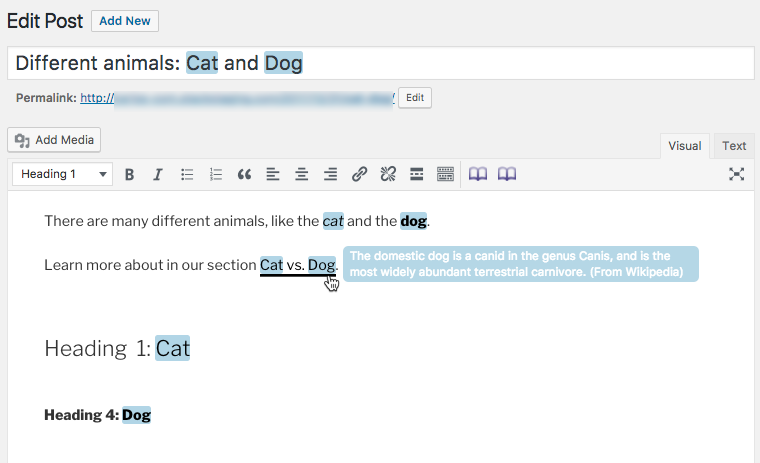 Enable editor visibility – Enable visibility to your editors and content writers for terms which are appearing on your glossary. 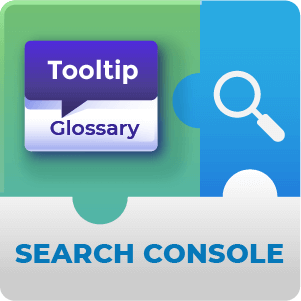 Check tooltips on the fly – Quickly and easily assess how the toolips will improve the user’s experience. 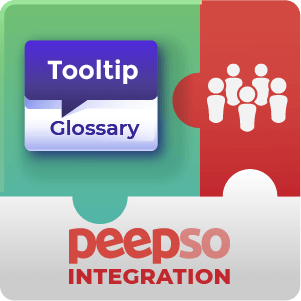 Provide Instructions – Provide instructions or warnings with specific terms that appear on the glossary. 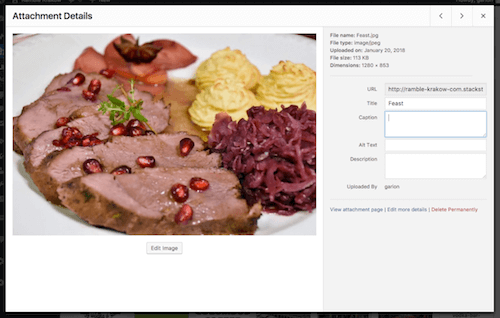 Support ACF Fields – Apply the editor tooltip also on ACF (Advanced Custom Fields) created fields. Show Tooltips in the Back-End – Inform your editors about important topics on the fly. They won’t have to preview the post or page to understand how the tooltips will enrich the audience’s experience. 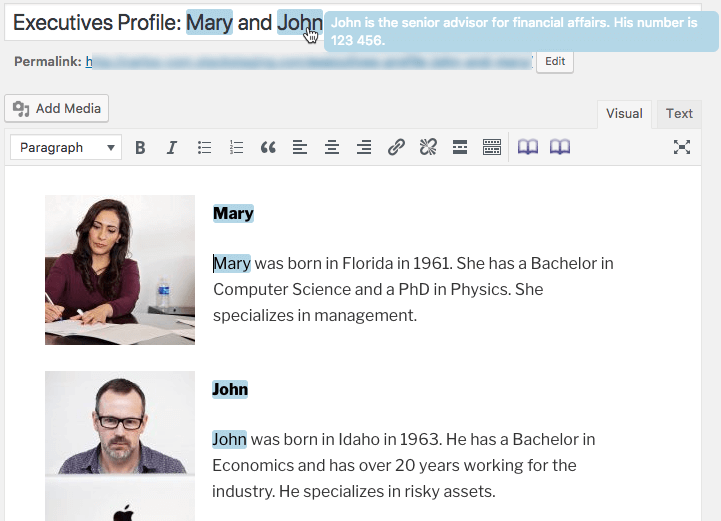 Title, Content and Excerpt – The tooltip will be available in all of these three fields. Works with pages and posts – The tool is not limited to posts. You can also use it on pages, to further enhance the editing experience. Default Description – You can set a default description for the editor tooltip. Tooltip Editor has many uses. The add-on also enables tooltips in the WordPress Text Mode. The add-on even recognizes formatted content. Tooltips show up in the Visual and Text modes. The Glossary Editor Tooltips add-on allows the display of tooltips in the page and post editor on the WordPress admin panel. This can be useful for serving you information when you need it while modifying the content of your site, for displaying warnings or just knowing what tooltip information appears on the front-end for content that you are adding while you’re adding it. To learn more about the add-on see this overview article. Does the Tooltip Editor add-on only display tooltips within glossary term post editor pages? No. it will display tooltips on any Page or Post edit screen within the WordPress admin panel. 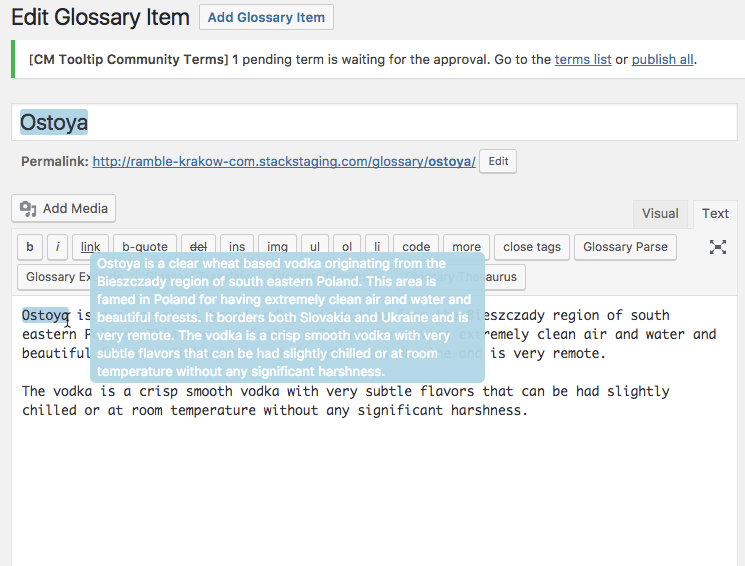 Will tooltips be displayed for glossary terms within the meta data editor for Media on the site? No. The editor does not display tooltips in the WordPress media manager. Are tooltips only displayed in the Visual editor for the page or also for the HTML (text) editor? The add-on will display tooltips in both the Visual Editor and the Plain text editor. Is it possible to display or hide tooltips from individual pages or posts? No. The Add-on only works across all page and post editor pages or none. To hide it while you are working you will need to disable the add-on. Can I display different Tooltips on the Back-end than those that are displayed on the Front-End? No. 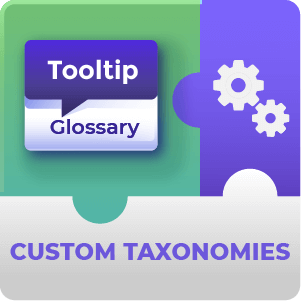 The Tooltip Editor Add-On works using the one glossary of terms and cannot differentiate based on tags, categories or custom taxonomies.